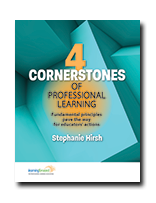 4 Cornerstones of Professional Learning, centered on a foundation of the Standards for Professional Learning, shares research, evidence from practice, and reflections from Stephanie Hirsh's career at Learning Forward, in schools, and as a school board member. Download here. 1. Lead with equity. Equity and excellence in teaching and learning is Learning Forward’s vision statement and represents the inspiration, challenge, and essential purpose for pursuing more effective ways to serve educators and students. 2. Invest in team learning. For every student to succeed, every educator engages in collaborative, job-embedded learning to strengthen capacity and collective responsibility. 3. Leverage high-quality instructional materials. Educators use their learning time to understand high-quality instructional materials and prepare for implementation, advancing their potential to improve student learning. 4. Advocate with evidence. To sustain support for professional learning at all levels, educators equip themselves with data from research and practice. They share that data with stakeholders and speak up for their learning and that of their peers. In addition to exploring each cornerstone, this paper offers focused actions for educators to take within their own contexts. If you would like to learn more about how to align your curriculum and learning teams, see how Learning Forward works with Professional Learning Communities, or contact Tom Manning, associate director of consulting and networks, to discuss a customized solution for your needs.